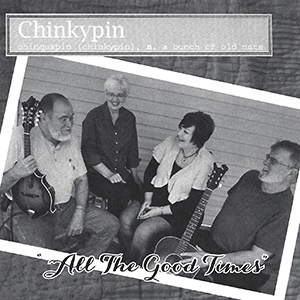 “Chinkypin” is the gleefully mis-spelled name of a once-endangered species of chestnut trees indigenous to the Ozarks, so it seemed right for our traditional string band. We are Kay Thomas, Pam Setser, Dave Brancecum, and Charley Sandage, and we mostly play at the Ozark Folk Center and on the front porch. Crystal McCool took over the bass duties on this project so Pam could sit in our little circle for live recording.